Before a new study, "astronomers found active galactic nuclei predominantly at the centers of the most massive galaxies, which are also the oldest and are making no new stars,” said James Aird, a postdoc at the University of California, San Diego’s Center for Astrophysics and Space Sciences, who led the study. This misconception was simply due to observational biases in the data, said Alison Coil, assistant professor of physics at the University of California, San Diego. Black holes, such as those at the centers of active galactic nuclei, can’t be observed directly as not even light escapes their gravitational field. But as material swirls toward the event horizon, before it’s sucked into the void, it releases intense radiation across the electromagnetic spectrum, including visible light. Of these, X-rays are often the brightest as they can penetrate the dust and gas that sometimes obscures other wavelengths. He searched the sky for X-rays from active galactic nuclei using two orbiting telescopes, the XMM-Newton and the Chandra X-ray Observatory, and compared those signals to a large-scale survey of about 100,000 galaxies that mapped their colors and distances. Coil led that survey, called PRIMUS, along with colleagues now at New York University and the Harvard College Observatory. Using the twin Magellan telescopes at Las Campanas Observatory in Chile, they detected the faint light of faraway galaxies. They measured both the color of each galaxy and how much the spectrum of that light had shifted as the galaxies receded in our expanding universe – an estimate of their distance from Earth. Because distances in space reach back in time, they’ve captured nearly two-thirds of the history of the universe in particular segments of the sky. Galaxies can be distinguished by the color of their light. Younger galaxies glow with the bluish light of young stars. As starmaking ceases, and stars burn through their fuel, the color of their light shifts toward red. In a sample of about 25,000 of the galaxies from the PRIMUS survey, Aird found 264 X-ray signals emanating from galaxies of every kind: massive and smaller, old elliptical red galaxies and younger blue spirals. They’re everywhere. 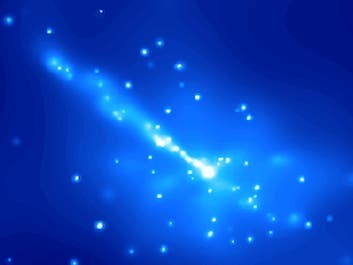 As suspects in the quenching of star formation, active galactic nuclei have been voted not guilty. Because the astronomers saw similar signals stretching far back into time, they conclude that the physical processes that trigger and fuel active galactic nuclei haven’t changed much in the last half of the universe’s existence. However, starmaking has ceased in many galaxies, probably when they ran out of gas, though it’s not clear how that happens. The interstellar gas could all be used up, turned into stars, but Coil studies another possibility: fierce galactic winds that have been seen blowing gas and dust from so-called starburst galaxies. The source of those winds, and their influence on the evolution of galaxies, is one of Coil’s main areas of current investigation. Black holes, such as those at the centers of active galactic nuclei (left), can’t be observed directly as not even light escapes their gravitational field. But as material swirls toward the event horizon, before it’s sucked into the void, it releases intense radiation across the electromagnetic spectrum, including visible light. Of these, X-rays are often the brightest as they can penetrate the dust and gas that sometimes obscures other wavelengths. More than a thousand X-ray signals illuminate a patch of sky called SXDF. The false colors in this image from a camera aboard the XMM-Newton spacecraft indicate the energy of the sources — from red for theweakest signals through green to blue for the strongest. The Subaru/XMM-Newton Deep Survey (SXDS) is a major new multi-wavelength survey of a ~1.3 square degree region of sky. The SXDS optical imagery represents an unprecedented combination of depth and area coverage, and will be combined with suitably deep images at other wavelengths to provide an accurate census of the contents of the Universe without suffering from the biasing effects of large-scale structure.